I wash my hair everyday…I have to because I have oily hair. I have naturally blond hair and although I have a lot of it, it is quite fine. So washing everyday has become the norm for me for the past 30 or so years. Because of this, lately I have been trying to look for shampoos that are a little more gentle not only on my hair but my body as well…our skin absorbs whatever we put on it. So I have been checking the ingredients in some of the commercially sold shampoos to see exactly what’s in them. Do we really need all of this in our hair and absorbed into our bodies? I really want to try and avoid using chemicals wherever possible so for the past week I have started making my own homemade shampoo using baking soda and conditioner using apple cider vinegar. Now this is probably not what you would recognize as a shampoo as it is suds-free so you won’t get that nice foaming action that you would expect in regular shampoos but it does work and it works really well…at least for my hair type. My hair can tend to be a little flat and lifeless but this gives it some body. I thought that using baking soda would cause my hair to dry out and be straw-like but so far I haven’t had a problem. I also thought I would have trouble getting a comb through it after washing. Again I haven’t experienced any problems. The only issue I had was on the fourth day of using it my hair felt dull and flat. It was almost like I had a build up of the baking soda and I was tempted to go back to regular shampoo. But I decided to stick with it and the next morning I ensured that I washed out the baking soda more thoroughly and I used the apple cider vinegar rinse on all of my hair instead of just the ends which is what I had been doing up until then. This seemed to do the trick. I have read where some people who normally wash their hair every day have found that they can now go for extended periods without having to wash their hair, by using this type of shampoo. As yet I haven’t found that to be the case but I have only been using it for less than a week now. Also, because I am currently using virgin coconut oil and magnesium oil on my face and body, it does tend to get into my hair especially overnight and cause the hair to look oily by morning…so that may be the reason. You’ve got nothing to lose trying it because it is extremely cheap to make – you will save a small fortune in shampoos! Plus it only takes a few minutes to mix up. 1/3 cup of baking soda – Most of us have used baking soda when baking as a raising agent or you may have used it in your fridge to absorb odors. It is also used in some antacids and toothpastes. 1 and a half cups of water -You can use pure water to make this if you like…I do, but regular tap water should be okay too. Mix ingredients and store in an old shampoo bottle ready to use. I tried using a spray bottle but the mixture didn’t spray very well at all. This will create a fairly watery mixture. I know some people prefer a paste but go with what suits you. Apply the baking soda mix to wet hair. Ensure you shake the bottle first as the baking soda will settle to the bottom. For your first wash you might like to wash all your hair with the baking soda mix. For the second and subsequent washes just wash the scalp area as the ends may dry out depending on your hair type. I simply pour the mixture onto the top of my scalp and massage in and then rinse thoroughly. If you don’t rinse well you may end up with an itchy scalp and possible dandruff and a build up over time leaving your hair looking heavy and lank. I find that the baking soda mixture quantities given above will cover about 3 to 4 washes…it just depends on your hair length and how much you want to use. Where Can You Buy Baking Soda? Baking soda (also known as bicarbonate of soda in some countries) can be found at most grocery stores. You can also buy it from Amazon here. Combine the ingredients and store in a spray bottle ready for use. It’s best to store in a spray bottle as it is easy to apply. Simply spray on the ends of your hair and massage in. Every now and then I will spray the mixture on my scalp as well. Rinse well after applying. You can leave in for a few minutes before rinsing off. 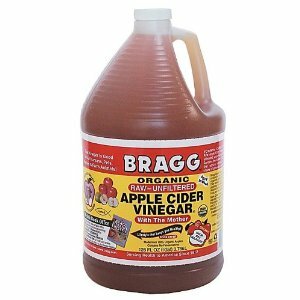 One of the best brands of apple cider vinegar is by a company called Bragg. You can buy it at most health food stores or from Amazon here. Hi-you should be putting the apple cider vinegar on the scalp as it neutralizes the alkali of the baking soda with its acidity. This brings your scalp’s pH back to normal. Thanks Linda, yes I do that every now and then. Mind you, I have been a bit lazy lately and have been using regular shampoo and conditioner. I have been trying out a few from iherb.com which have fewer chemicals. Yeah, I wish this worked for me. I wanted it to. I do still love the apple cider vinegar rinse, mind you! I also do, every once in awhile use a baking soda rinse if my scalp is feeling gritty with a little Vitamin C mixed in. It works a treat. I’d never thought to use vitamin c as part of a rinse. I did a bit of quick research and vitamin c can be used to help remove chlorine from your hair and also to pull out the color in your hair so probably not a good one to use if you are using a hair dye. If you are dying your hair dark, it could be problematic but if you lighten your hair it is a miracle at getting the “gunk” out of your blonde (my hair darkens and turns orangey with water).